The arms are the upper limbs of the human body (the legs are the lower limbs). The arm connects to the torso via the shoulder. At the distal (or far) end of the arm is the hand, which unlike many other animals includes an opposable thumb, enabling us to grip and grab things. The shoulder girdle anchors the arm to the torso and allows for a wide range of motion in the arm. The shoulder girdle consists of the scapula bone and the clavicle bone. The scapula bone is a large, triangular, flat, and relatively thin bone that floats across our back. It articulates with the clavicle as well as the head of the humerus bone in the arm. 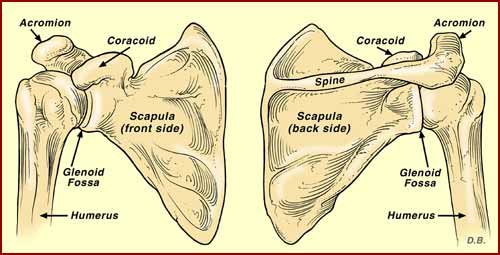 The scapula is also known as the shoulder blade. This is the bone that we can see on our back when we move our arms and shoulders. It is quite a unique bone because even though the surface of the scapula is quite thin, many shoulder and arm muscles attach to this bone and give it a lot of strength. It is also uniquely shaped and has two protruding parts (known as "processes") called the coracoid process and the acromion process. The acromion process is a continuation of the scapular spine, where many of the previously mentioned muscles of the shoulder attach and connect to the clavicle bone to create a joint. The coracoid provides additional support to the shoulder joint along with the acromion by helping to keep the humerus in the shoulder socket. The shoulder socket is also known as the glenoid fossa or glenoid cavity and this is where the arm meets the shoulder girdle. 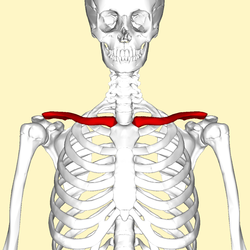 The clavicle is part of the shoulder girdle and is also is known as the collar bone. This is the bone that we can see at the front of our shoulder near our neck. 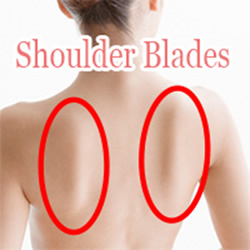 It has a slight 'S' shape to it; it connects to the acromion process of the scapula (shoulder blade) as well as the manubrium of the sternum in the center of our chest, where the ribs also attach. It is a common injury to fracture or dislocate the clavicle, which usually occurs when someone falls sideways onto their shoulder or tries to catch themselves by putting their arm out during a fall sideways. 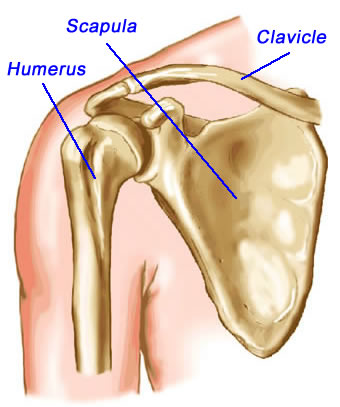 This injury can also occur when the clavicle is directly impacted by a hit. The humerus is the largest bone in the arm. It articulates with the glenoid fossa of the scapula to form the shoulder joint. 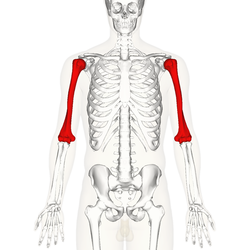 The shoulder joint is a ball-and-socket type of joint like the hip, which allows for a large range of motion. At the distal (far) end of the humerus is the elbow joint, which is where the humerus articulates with the radius and ulna of the lower arm. 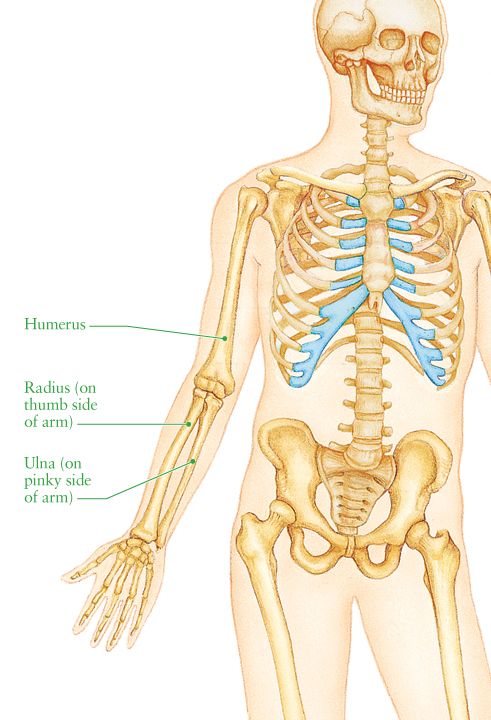 The ulna and radius bones are the two bones of the lower arm. It is important to note that these two bones cross over each other when we turn our arms (pronation), so anatomical reference position is always with palms facing out (supination) so that the bones are not crossing each other. In anatomical position, the radius is always on the outside (lateral) and the ulna is always on the inside (medial) of the arm. The radius is shorter and thicker than the ulna. 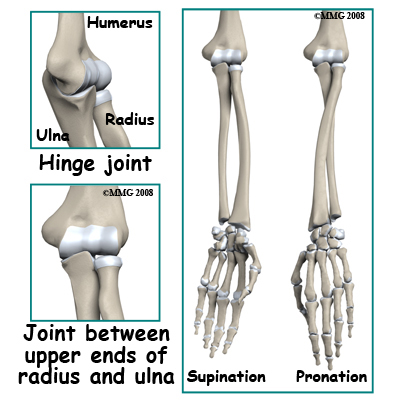 The proximal ends of the ulna and radius form the elbow joint with the humerus bone, which is a simple hinge joint. The distal ends of the ulna and radius attach to the wrist. The wrist is a collection of small bones known as the carpal bones. 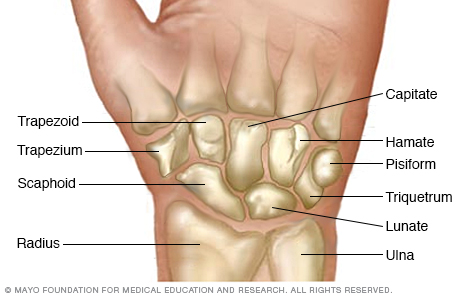 The carpal bones of the wrist each have a unique name and shape: scaphoid, lunate, triquetrum, pisiform, hamate, capitate, trapezoid, and trapezium. The bones of the wrist attach to the bones of the hand. 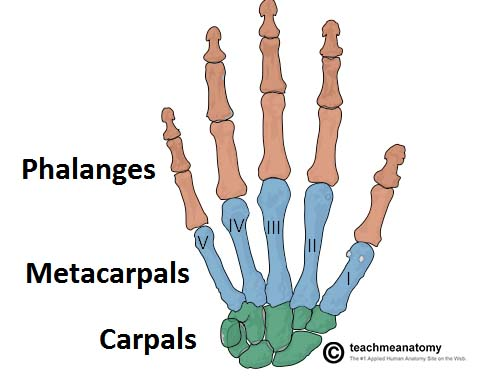 Recall that the foot has tarsals, metatarsals, and phalanges; by comparison, the hand has carpals, metacarpals, and phalanges. The metacarpal bones do not have unique names like the carpal bones do, but are often identified by number, starting with the thumb as the first metacarpal bone (the thumb is most medial in anatomical position) and the pinky as the fifth metacarpal bone (the pinky is the most lateral in anatomical position). Each finger has three phalanges bones and the thumb only has two, just like the phalanges in the feet (the big toe only has two phalanges). MLA (Modern Language Association) "Bones of the Shoulder, Arm, and Hand." ScienceAid, scienceaid.net/Bones_of_the_Shoulder_Arm_and_Hand Accessed 25 Apr 2019. Chicago / Turabian ScienceAid.net. "Bones of the Shoulder, Arm, and Hand." Accessed Apr 25, 2019. https://scienceaid.net/Bones_of_the_Shoulder_Arm_and_Hand.